Lights, Camera, Action!! Yay, it was a sparkly, glamorous evening full of glitter and pizzazz! Yes, Saturday night saw us donning our best clobber and become paparazzi for the night! Well actually I dressed up in sparkles and sequins, and Lee dressed in a more “paparazzi” like way – does he look the part? All in aid of a very worthy cause! I’ve mentioned before about my friend Lynn’s charity, Their Future Today www.theirfuturetoday.com The amazing work she has done and the incredible difference it has made to the lives of the children and their families in Sri Lanka is quite simply phenomenal. Please take a moment to take a look at her website if you can. 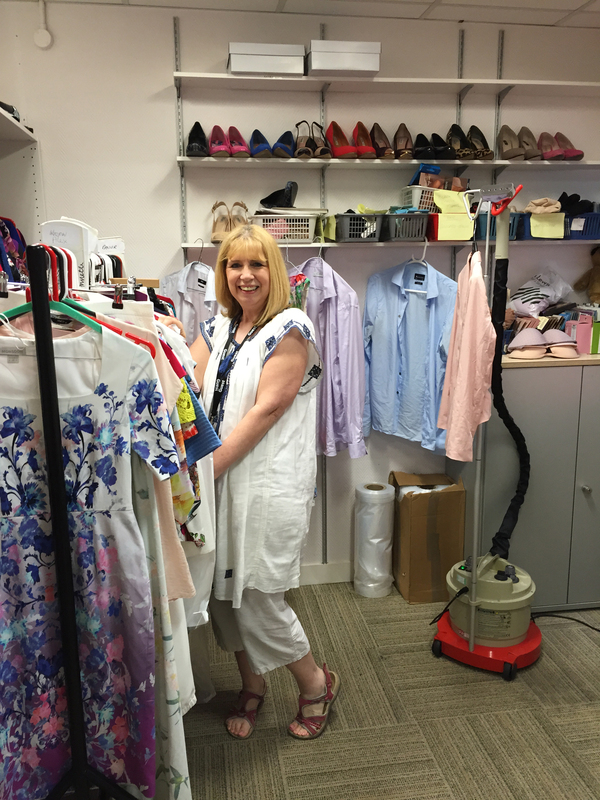 Lynn organises a fundraising ball every year, which in itself is a huge task. Each year has a different theme and this year’s was, as you have no doubt gleaned, A Night at the Oscars. The venue, Hampton Court House School, is absolutely stunning. To add to the authenticity of the occasion, a beautiful classic red car was lit up and parked outside the house for the evening. Forgive me, my knowledge of cars is extremely limited, so unfortunately I can’t recall the model. Shame on me! Suffice to say it was a breathtaking sight to behold!! As the guests made their way through the double front doors, they were met with spotlights shining down upon them, with our cameras ready to “pap” them as they walked along the red carpet – a VIP grand entrance for all! After a champagne reception and tasty hors d’oeuvres, it was time for a delicious dinner created by international chef Edson Lopez Junior. After dinner, Lynn’s moving speech and the slideshow of pictures showing some of the incredible work the charity does in Sri Lanka, along with heart-warming stories from the children, bought a tear to many an eye and truely brought home the importance of what the night was all about. Folk were very generous in the auction, with so many amazing things to bid for, from luxury holidays to limited edition prints, all kindly donated, so every penny raised goes to the charity. Then it was dancing til midnight to the fabulous band DAFT http://www.daftonline.co.uk/ – they really are a top notch band, and got everyone on their feet! So a fantastic and very successful evening once again! 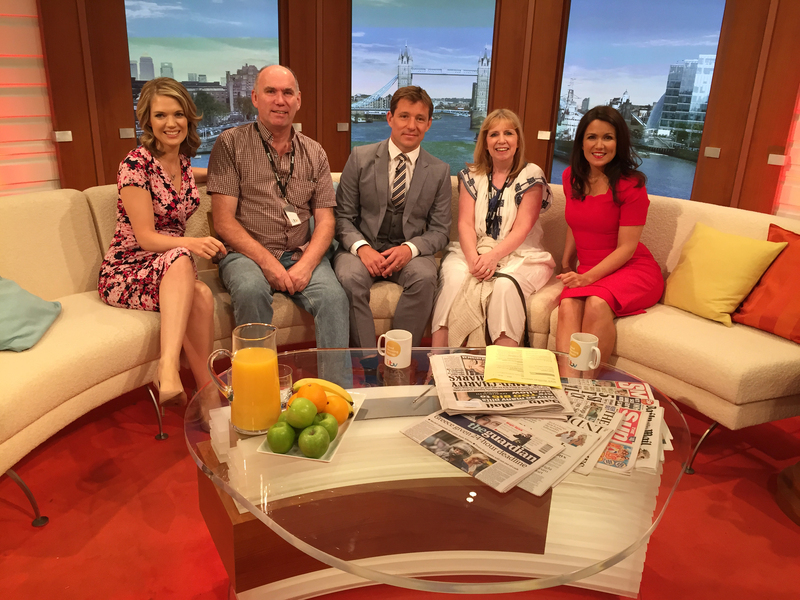 Yes, that’s me sitting on the “Good Morning Britain” sofa between the lovely Ben Shephard and Susanna Reid. Well, back in February, Lee and I went to a fantastic ball organised by my friend Lynn in aid of the charity she set up ten years ago, Their Future Today http://www.theirfuturetoday.com/. 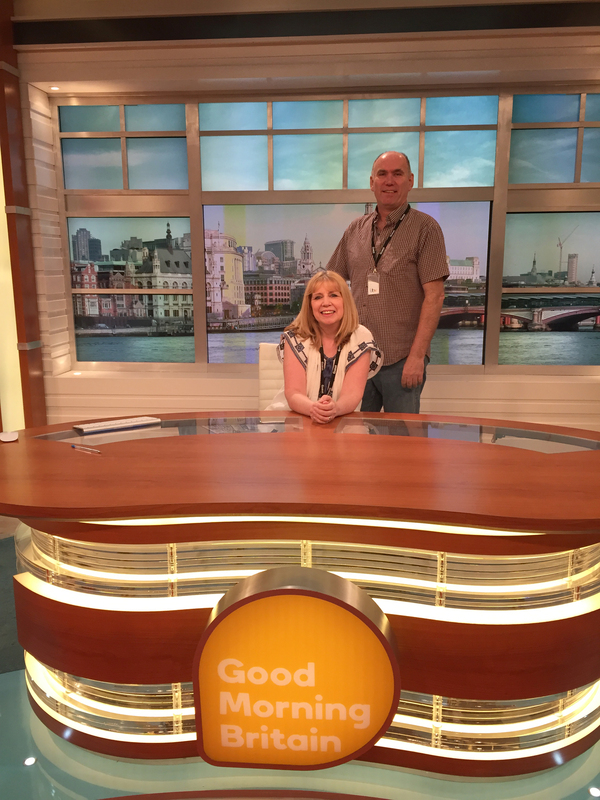 One of the prizes which had been donated for the silent auction was a “Behind The Scenes Tour” of Lorraine and Good Morning Britain. As a surprise treat for me, Lee put in a bid … although he did come clean by the end of the evening and tell me about it. To our amazement his bid was the winning one! Now, after several months of anticipation, the date of our tour finally arrived. #Excited!! We were up with the lark and caught the 5am train from Southampton to Waterloo – the only one that arrived in good time. It worked well as we had had chance to grab a quick breakfast at Waterloo before taking a leisurely stroll to the ITV Studios. No mad rush, thank goodness. 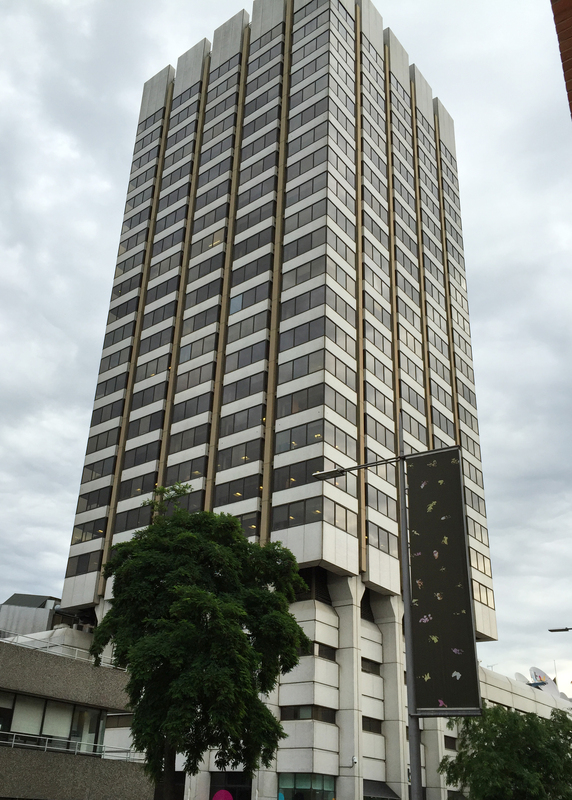 The tall and imposing ITV building suddenly appeared in the distance. It looked familiar to us, having seen it on screen a few times. We were greeted by a very friendly lady called Christine who was to be our guide for the morning. Our first stop was the canteen, which overlooks some great views of the Thames, and also of an adjacent studio from where This Morning is transmitted. 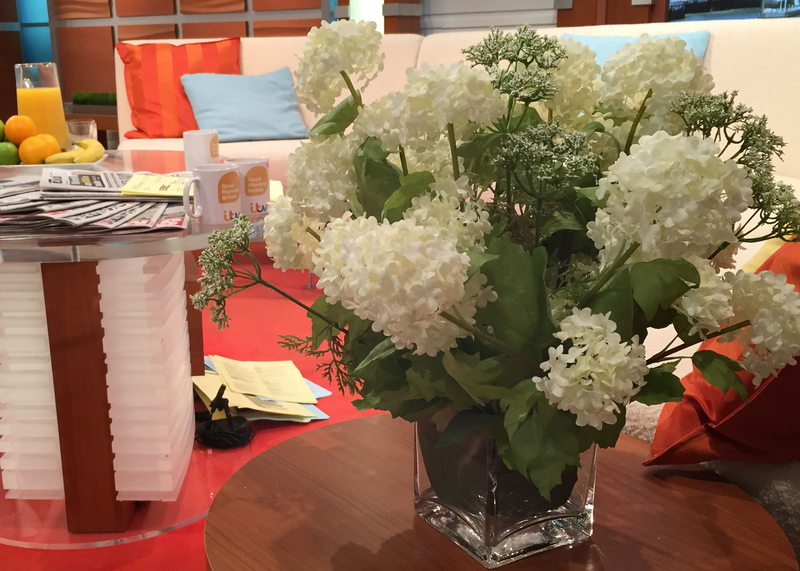 We were then shown the green room where guests on the show are looked after whilst waiting to be interviewed, fittingly just outside the door to the main studio where Good Morning Britain is filmed, so they can be quickly whizzed across when needed. Next stop … we were allowed to quietly slip into the gallery where the producers and directors sit in front of a myriad of TV screens, each with a different job to do. It was very interesting to watch them so efficiently at work; instructions were being fed into the earpieces of the presenters, and counting down the seconds to them until the next ad break or VT. Fascinating for us to watch it all going on as the programme went out live. There was a certain amount of tension in the air, but all very slick as you would expect. 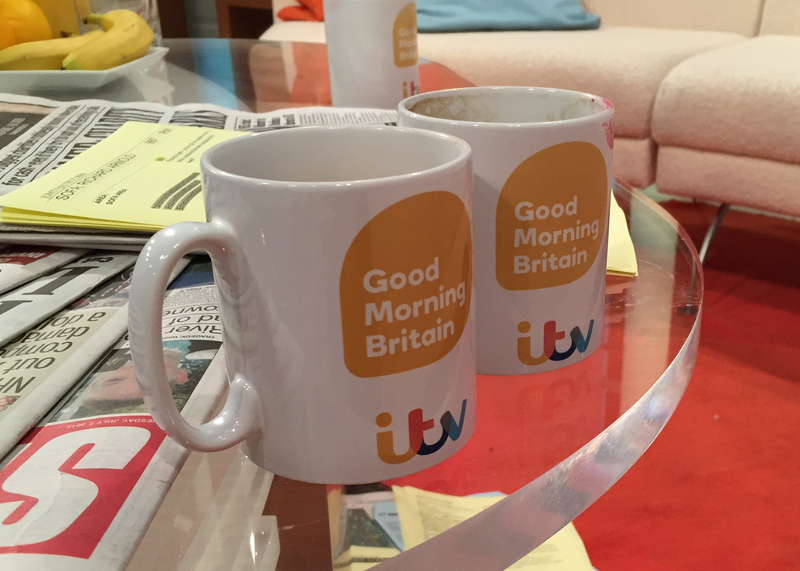 We waited there until Good Morning Britain went off air; you could feel a kind of sense of relief in the room. Pressure off, and another show in the bag. 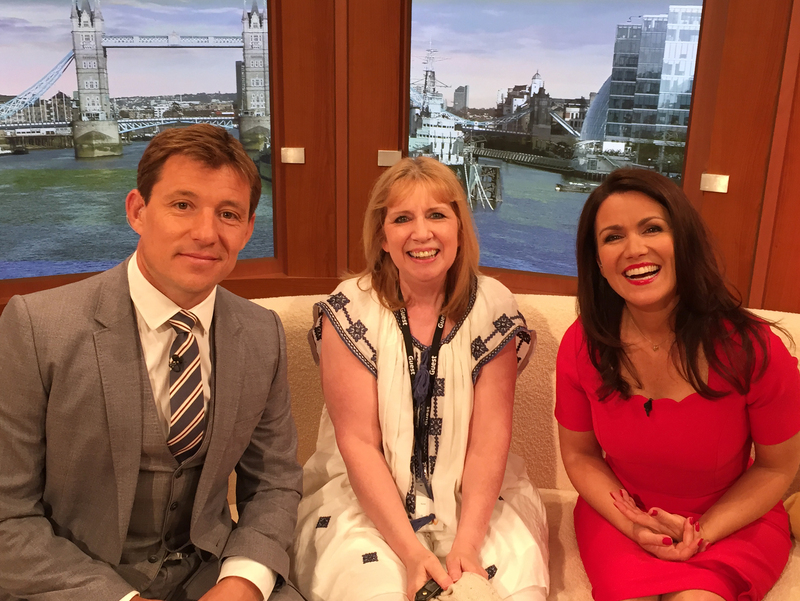 Christine then took us from the gallery and onto the Good Morning Britain set and introduced us to the presenters, Ben Shephard, Susanna Reid, who were still sat on the sofa having just finished the show, and Charlotte Hawkins, who strolled over to say hallo from the news desk. They were all very welcoming and happily posed for some pictures with us and a quick chat before they headed off to their debrief meeting. Christine asked if she could use my phone to take pictures so we could be in all the shots! We hadn’t expected that at all, I thought we might be allowed to take a couple of “selfies” with the presenters if we were lucky, so it was really great that she took over taking the photos as she of course knew which pictures were allowed. 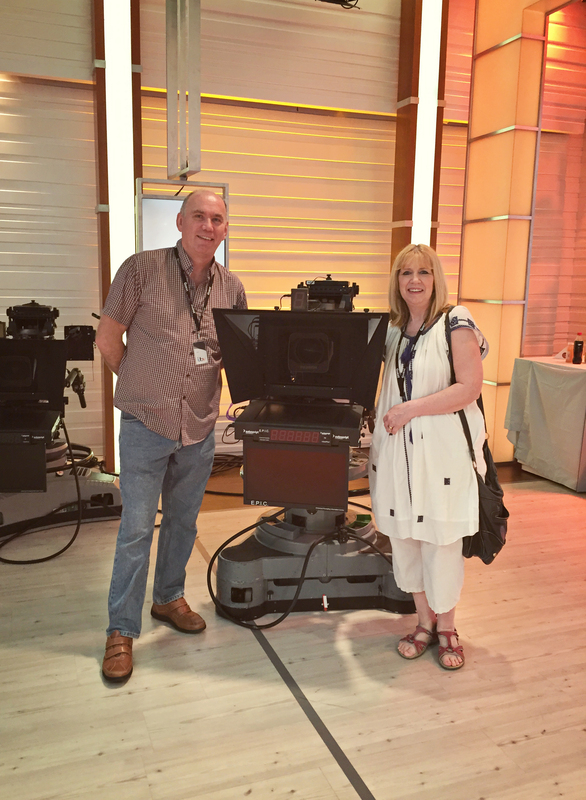 The studio where Good Morning Britain is filmed is used only for that show at the moment, so once the presenters had left the studio, we were allowed to have a good look round – and as you can see, Christine took lots of photos of us in various areas of the studio. 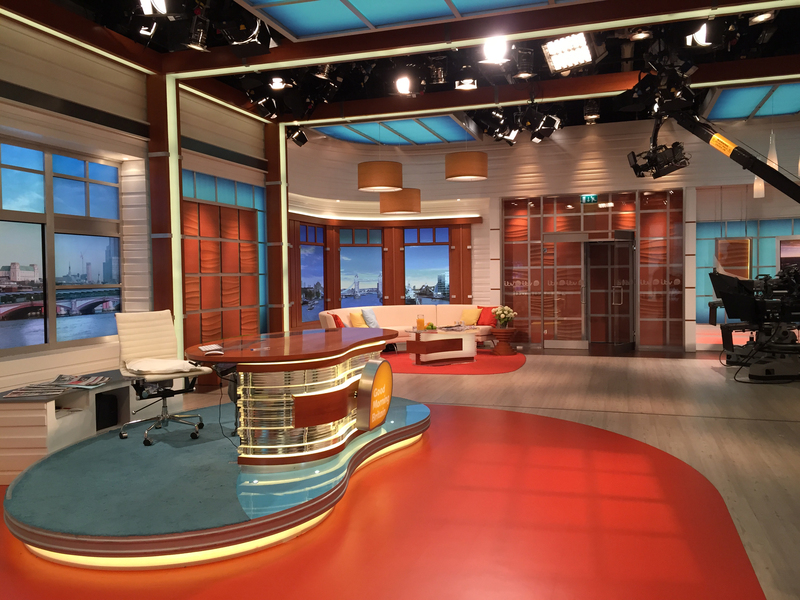 It felt really strange being there, having seen it so often on the TV, and now being able to sit on the familiar cream sofa, and behind the news desk etc. Christine then took us along to show us where hair and makeup are done, and then to the wardrobe dept, where the presenters’ clothes were neatly hanging. We loved the way all the lifts had different pictures on the doors. 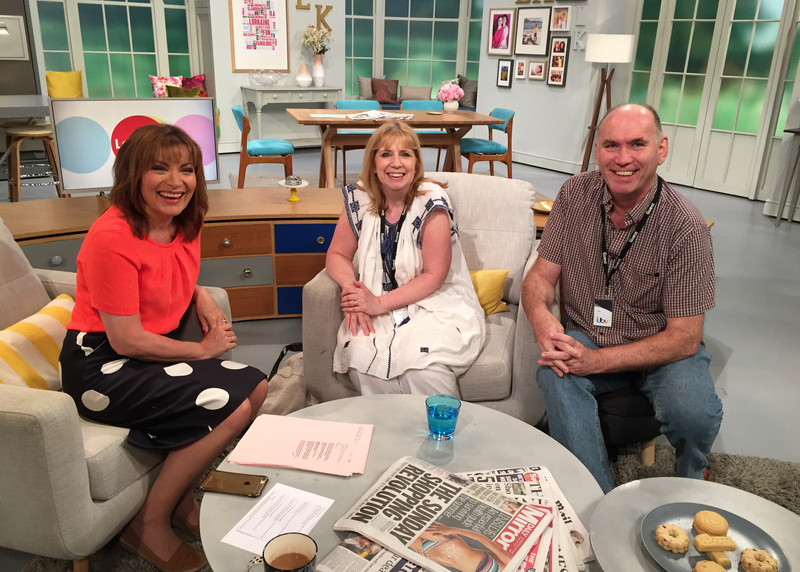 Lorraine was now on air in another studio downstairs. We headed down there and sneaked in behind the black curtain which surrounds the set where she was recording. Fashion stylist Mark Heyes was waiting to go on with with some models for the fashion feature. We were lead round to stand behind the cameras and got a birdseye view of Lorraine chatting to her guest, Levi Roots. We stayed and watched whilst the rest of the show went out – Mark Heyes introducing the 4 models in various outfits. Before we knew it, the show was over. We were introduced to Lorraine, who was very friendly, and again Christine grabbed my phone to take a few shots. 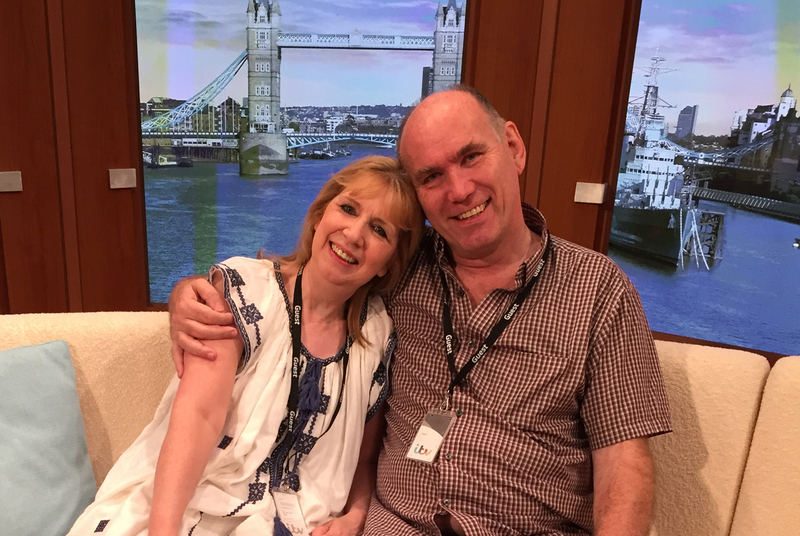 It was quite a brief meeting with Lorraine as the studio has to be turned round very quickly to become the Loose Women set for later in the day, so there was no hanging round, it was all systems go!! 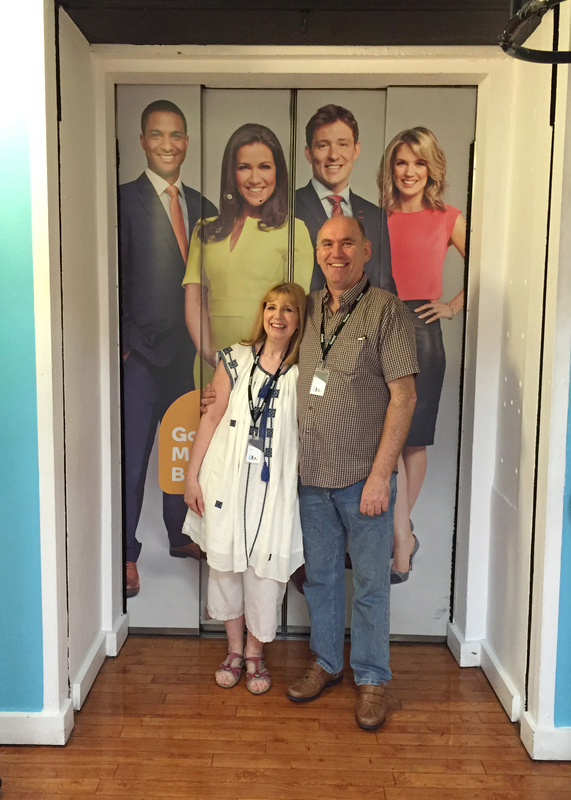 After all that excitement, we went back with Christine to the main reception, via the outside of the studio where there are several famous hand prints hanging on the walls. ITV’s own Hall of Fame. Our grand tour was at an end. We said our thanks and goodbyes to Christine and headed out along the South Bank to spend the rest of the day exploring London. Big thanks to Their Future Today for giving us this once in a lifetime opportunity to have a fascinating glimpse into the world of live television! Beforehand we had no idea of what the tour would actually involve; it far exceeded our expectations! Glorious sunshine and beautiful surroundings made for a fabulous afternoon at Hampton Court School summer fete – and in aid of a very worthy cause. We were there primarily to take pictures of the pooches in the dog show. This was a little challenging in the heat … and of course, dogs being dogs 😉 But great fun all the same. They each have their own special little characters and can do some really funny, and often unexpected things, which gave the spectators a good old giggle! That’s the great thing about photographing animals – the spontaneity of it all!! Once we’d finished taking the pictures, we had chance to wander round and enjoy the fete before we headed back up the M3. ‘Twas very relaxing to have a natter, Pimms in hand, bask in the wonderful sunshine, and listen to the band playing some pretty cool tunes. Lee and I couldn’t resist treating ourselves to one of the beautiful paintings from the Art Fair. We both fell in love with it and knew if we didn’t get it there and then, we’d have wished we had all the way home. It was very reasonable too and looks great up in our lounge, so we’re very glad we did. A very close friend of mine, Lynn, set up her charity, Their Future Today, soon after the massive tsunami in December 2004, which, in Sri Lanka, left large numbers of children orphaned or abandoned in underfunded state run institutions around the country. Since then, what Lynn has achieved through her tireless efforts, often against all odds, has been absolutely amazing and made an enormous difference to the childrens’ quality of life. She is truely inspirational. Each year she holds a fundraising ball, with themes such as Bollywood, Great Gatsby or Moulin Rouge. This weekend we took the pictures at a birthday party in London for the winning bidder of one of the prizes which we had donated to the auction at the last ball, and it was a lovely occasion to be part of, a truely memorable afternoon!